Some of the world’s most famous and accomplished sailors are getting ready for the start of the 9th edition of the China Cup International Regatta. 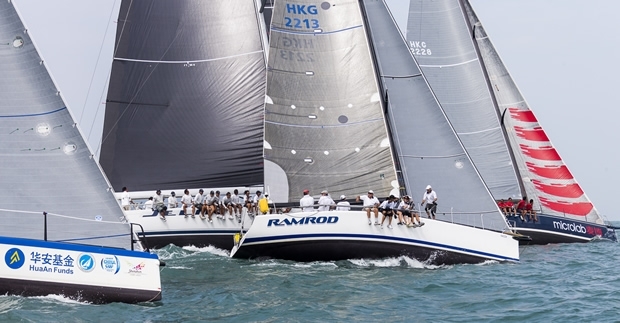 After a skippers’ briefing at the spectacularly located Royal Hong Kong Yacht Club, the four-day regatta starts with a passage race on 30 October 2015, and concludes on 2 November after three days of short-course racing in Daya Bay near Shenzhen, China. With 111 boats representing more than 30 different regions and nations, entered across six racing divisions, the international fleet sees everyone from virtual beginners to Olympic Champions racing alongside each other. The Beneteau 40.7 fleet is always the most hotly contested. A new entry to watch out for is Emirates Team New Zealand skippered by one of the world’s up and coming match racers Chris Steele, with a crew that includes heavy hitters from the America’s Cup like Kelvin Harrap. ETNZ are unlikely to have it all their own way in the 40.7s, with Volvo Ocean Race veteran and former match racing world champion Adam Minoprio sailing on board Steve McConaghy’s highly rated team on Team Wanhang Longcheer. Ed Smyth has won this event before, and the Australian America’s Cup sailor is this year skippering Cheung Kong Sailing Club from China. Match racer Damien Iehl skippers a strong French team on Team Beneteau, and there are many other high-level crews flying in from as far afield as Sweden, Canada, Argentina and Uruguay. The China Sailing Tour team will be skippered by talented America’s Cup and ocean racing sailor Liu Xue and among his crew are members of the Dongfeng Race Team which competed in the Volvo Ocean Race earlier this year. Vice-president of the International Sailing Federation, W. Scott Perry, is skippering Team Yauguru, whose crew usually competes on a 1947 classic boat in regattas in Uruguay and Argentina but who is looking forward to competing in China for the first time. For the local crews, racing against such high-quality international competition offers a great opportunity to advance their own skills as the sport of sailing continues to grow meteorically in China. Many overseas teams have already raced at the China Cup multiple times, always attracted back by the warm weather in late October combined with good, close racing and affordable entry and charter fees. For the first time this year at the China Cup, jury chairman John Doerr and his experienced international jury are using on the water judging for the first time, which should lead to fairer racing and shorter evenings in the protest room. The evening parties at the Sheraton Hotel Dameisha are lavish, spectacular affairs, and there’s nothing worse than missing out, sitting in a protest room until late at night. The on-the-water judging should give everyone a better chance of enjoying the partying as well as the competition. Among the faster boats in the fleet will be the TP52, Team Centennial, which is sailing from the Philippines to race in the regatta. Previous division winners to watch out for include Shawn Kang’s Beneteau 50 Lighthorse, Nick Southward’s J/109 Whiskey Jack and perennial performer and last year’s IRC division winner Jelik III, the Reichel-Pugh 75ft racing sled skippered by famous Hong Kong sailor Frank Pong. Jelik will be expected to be among the front runners in the opening Hong Kong-Shenzhen Passage Race to Daya Bay, where the regatta will be based for the remaining three days of inshore racing. The China Cup International Regatta 2015 takes place over four days from 30 October to 2 November in the waters of Shenzhen and Hong Kong. As of 16 October, there are 111 entries representing more than 30 countries and regions including: Argentina, Australia, Austria, Belgium, Canada, China, Chinese Taipei, France, Germany, Great Britain, Greece, Hong Kong, Ireland, Italy, Japan, Macau, Malaysia, Netherlands, New Zealand, Portugal, Philippines, Russia, Singapore, South Africa, Sweden, Switzerland, Thailand, Turkey, Uruguay and USA. China Cup International Regatta is approved by the General Administration of Sport of China, and co-sponsored by Water Sports Administration Center of the General Administration of Sport of China, as well as the Shenzhen Municipal Bureau of Culture, Sport and Tourism. It is the largest China-initiated international sailing regatta, and the biggest First 40.7 regatta in the Asian-Pacific region. China Cup International Regatta was awarded 'Asian Regatta of the year 2012' at Asian Marine and Boating Awards, and by brand value is recognised as one of the top 10 sporting events in China.